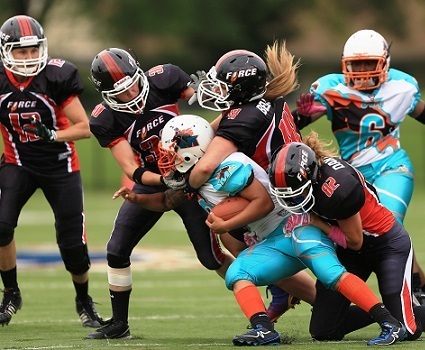 EVANSTON, IL: The defending national champion Chicago Force continued their winning ways with a decisive 66-8 win over the visiting Miami Fury. The game featured the triumphant return of Force quarterback Sami Grisafe, who missed two months with a leg injury. Grisafe found her groove in the second quarter when she threw the first of her three touchdown passes to league leading receiver Jeanette Gray. Grisafe was awarded the Offensive Game Day MVP trophy for her efforts. "Sami's return to play was as planned," said Head Coach John Konecki, "She is 100% and ready to lead our team into the next round of playoffs." Chicago amassed 502 yards of total offense while scoring 9 touchdowns. 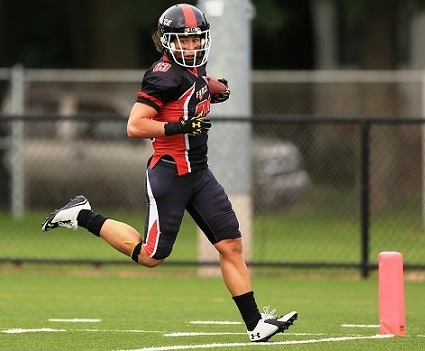 All-American running back Kelsey Casey had another strong game with 17 carries for 175 yards and 3 touchdowns. Back-up quarterback Kerri Olivar threw a touchdown pass to Gray, who finished with 192 receiving yards for 4 TD's and also had a rushing touchdown. Starting defensive back Dorian Bridges performed double duty when she had 5 carries gaining 82 yards and scoring on an electrifying 75 yard touchdown run. The Miami Fury, who finished the season at 7-3, have achieved most of their yardage this year running the ball. Against Chicago the Fury had limited success, tallying 146 yards rushing, but -1 yard passing. Speedy Miami running back Etta Paul burst through the Force defense midway through the 4th quarter on a 48 yard TD run for the Fury's only score. With the Chicago defense smothering Miami's passing game, the Fury became one dimensional and found the going tougher as the game wore on. The Force defense was led by Defensive Game Day MVP Melissa Nelson, who led the team with 9 tackles and an interception. Konecki displayed some frustration with his squad as they seemed sluggish at times, particularly in the first half. But is "pleased with the continued development of this team. Obviously there are things we need to work on in the next two weeks in preparation for the conference championship." This win propels the Force into the conference championship versus the Boston Militia for the third year in a row, played on July 19th at Dilboy Stadium in Somerville, MA. In 2011 the Militia eliminated Chicago from the playoffs, but the past two years Chicago has ended Boston's season while advancing to the National Championship. It will be a battle between the top two teams in women's football. The winner will play in the National Championship at Chicago's Lane Stadium on August 2nd. For more information please visit chicagoforcefootball.com or call Sam Powell / Game Day Operations at 312-371-7813.